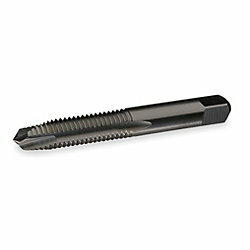 Sprial pointed taps (or gun taps) are designed for tapping thorught holes or blind holes which are deep enough for chips to collect at the bottom of the hole. The spiral point forces the chips ahead of the tap, thereby preventing clogging. Suitable for tapping most materials, especially those with high ductility.